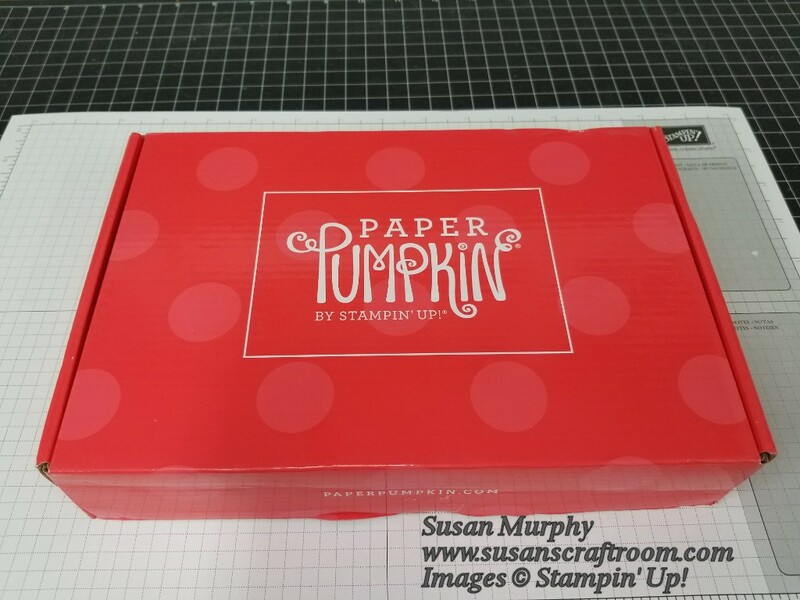 Susan's Craft Room: It's Paper Pumpkin Time! I received some "happy mail" today! The September 2017 Paper Pumpkin is Here! Did you notice what is NOT on top of the Paper Pumpkin logo? My address label! Now it is on the bottom of the box. Thank you Stampin' Up! I love that they now put the name of the kit & the date on the end of the box! This is helpful when I have extra Paper Pumpkin kits that need to be put together. I know right away what is in the box. 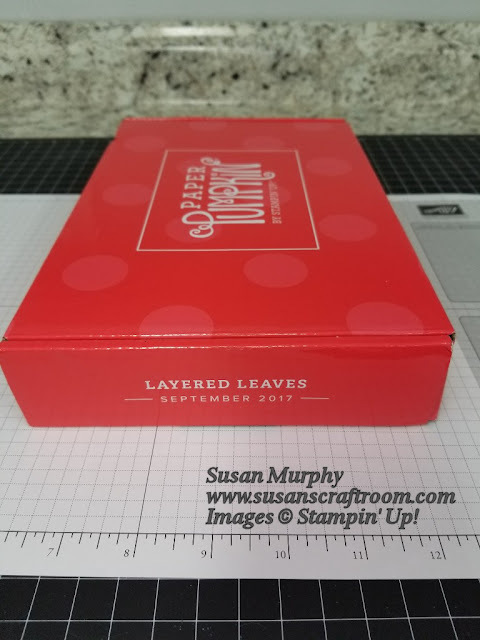 Thank you again Stampin' Up! 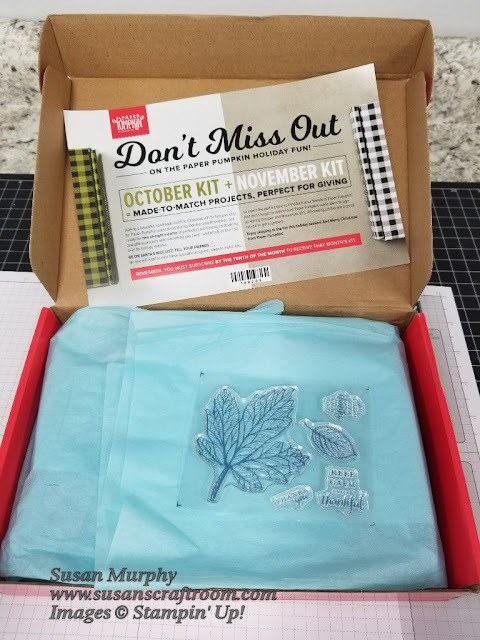 When I opened the box there was a flyer about the October & November kits. They are going to coordinate! Wahoo! From the looks of the flyer they will also coordinate with products in our Holiday Catalog! Even better! The set has beautiful leaf stamps along with 3 nice sentiment stamps as well! BONUS! This is definitely a stamp set that I will be able to use year round. The stamp set alone is worth the price of the kit. 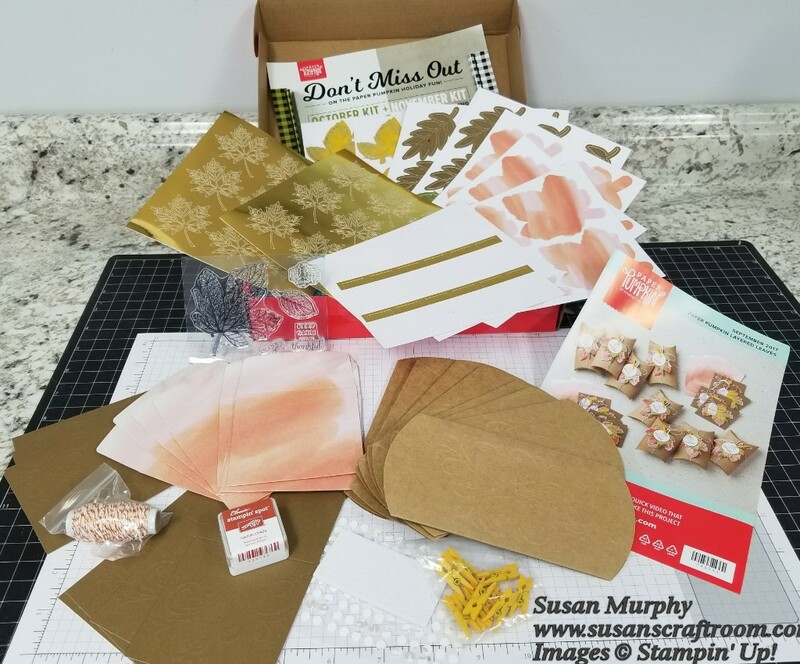 Have you ever wondered what is in a Paper Pumpkin kit? THIS is all the parts in the September kit. It has an instruction brochure with photos along with the written instructions. 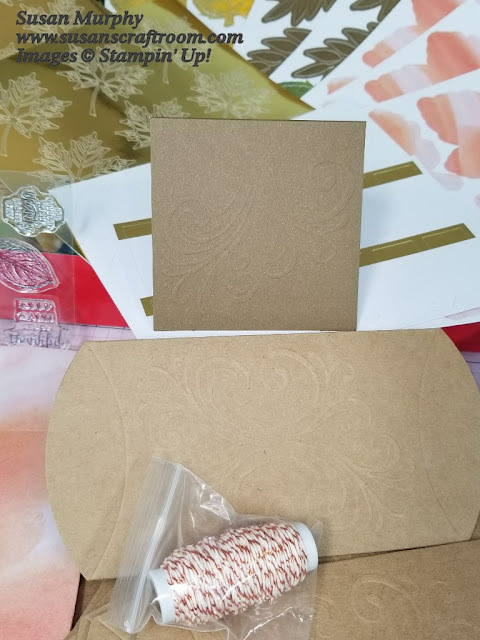 It includes a full stamp set and a stampin' spot ink pad that can be used over & over, all the accessories and specialty adhesives you will need. It even includes envelopes for cards! All you have to add is your basic adhesive and scissors! You can follow the directions exactly or use your imagination and create something totally different. Add additional personal supplies and the ideas are endless! The kit price is $19.95. Of that, $14.95 is for the actual kit and the rest is the postage to get it to you. It's a pretty good deal! Look at the awesome raised embossing on these pillow box favors & 3x3 cards! These pieces can easily be cut apart and used as an embellishment or layer on a full size card! Check out that beautiful copper & vanilla bakers twine! There are always leftovers in the kits. I hope there is a lot of this bakers twine left over! Every month Stampin' Up! puts together a video showing how to assemble the projects in the Paper pumpkin kits. Here is the video for this kit! Interested in subscribing to Paper Pumpkin? CLICK HERE to take you to my website where you can click on the link to subscribe and get your own Paper Pumpkin subscription. TIP: You can skip months. I sometimes go a few months and skip them. I never skip the kits just prior to a holiday though! BONUS! Paper Pumpkin subscribers are the only customers who can purchase available past kits - even during a month that you are "suspending" your kit and skipping a kit! Some kits even have refill kits available to subscribers! You can see the previous kits that are currently available on my website.